If you missed the livestream though, don't worry, because you’ll find all the information below about everything announced. 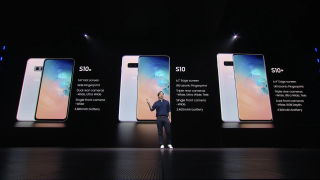 The Galaxy S10 also has a refreshed design, with a punch-hole in the screen for the 10MP front-facing camera. The world's first ultrasonic fingerprint scanner is also built into the display, so bezels are kept to a minimum. This included a triple-lens rear camera and an in-screen fingerprint scanner. It starts at $999 / £899 (roughly AU$1,640), so if you're after one of these phones then you'll need to get saving quickly. Unless you're filthy rich, then maybe buy 10 just to demonstrate your wealth. On top of that there's also a 3D depth-sensing camera, useful for augmented and virtual reality, as well as facial recognition. It won't be launched until later in the year though, when the networks start rolling out their 5G signal across the globe. That’s the phones out the way, but handsets aren't all Samsung has unveiled, as we’ve also seen the Samsung Galaxy Watch Active. That said, we're not really sure how much of an upgrade it is - check out more in our in-depth look below (linked below).